I am REALLY excited to share this recipe with you. I personally think that I’m a genius for coming up with it, but you’ll have to judge that for yourself when you make it. This unusual crumble is fragrant, perfectly textured, and sweet but totally breakfast-level-healthy. HUGE bonus if you have a juicer, like me, you can use the pulp leftover after juicing carrots in this recipe. I hate throwing all that delicious healthy fibre away. OK I can tell I’m getting weird and nerdy, so let’s just move on to the recipe. Mix together first 4 topping ingredients in a small bowl. Add melted butter and mix well. Set aside. Dissolve cornstarch in the cider, then add sugar, vanilla, and cinnamon, and mix well. 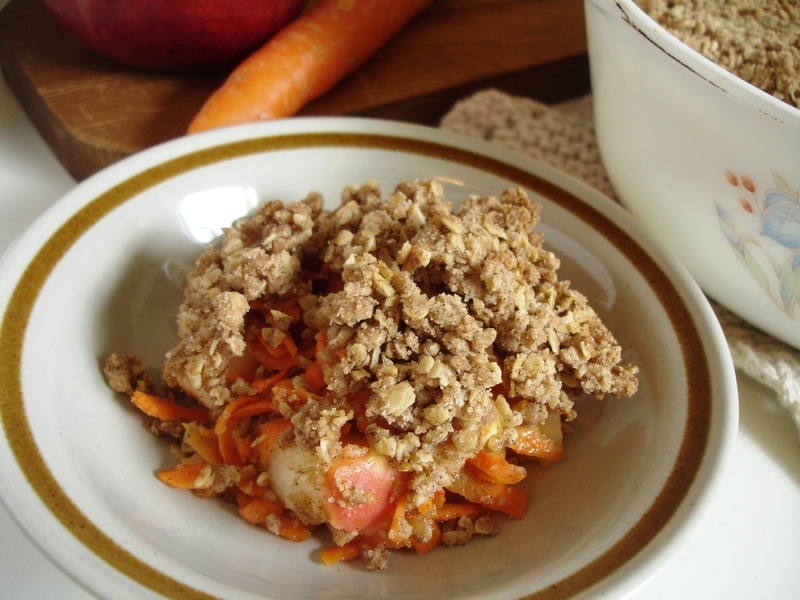 Mix apple and carrot together in a medium bowl. Add liquid to the apple and carrot and mix to coat. Place filling in a greased casserole dish**, pack down, and cover with topping. *I didn’t grate my carrot finely when I made this recipe to take pictures for this post and the texture suffered – so take my advice and grate that carrot good. **I use a smaller round casserole dish for a deep-dish crumble, but you can also use a 9×9 inch dish for a regular-depth crumble. I’m currently working on my third gigantic can of pumpkin purée of the month. I have eaten pumpkin in every meal of the day for several days in a row. Possibly my favourite pumpkin dish is mac n cheese – my personal recipe is very similar to this one by CCK, except non-vegan, and I usually add onion and a bit of nutmeg and sage. I’m also a fan of pumpkin grilled cheese. So that covers lunch and dinner, but how to I incorporate pumpkin into breakfast (other than eating pumpkin pie for breakfast, which I am guilty of)? In smoothies of course! 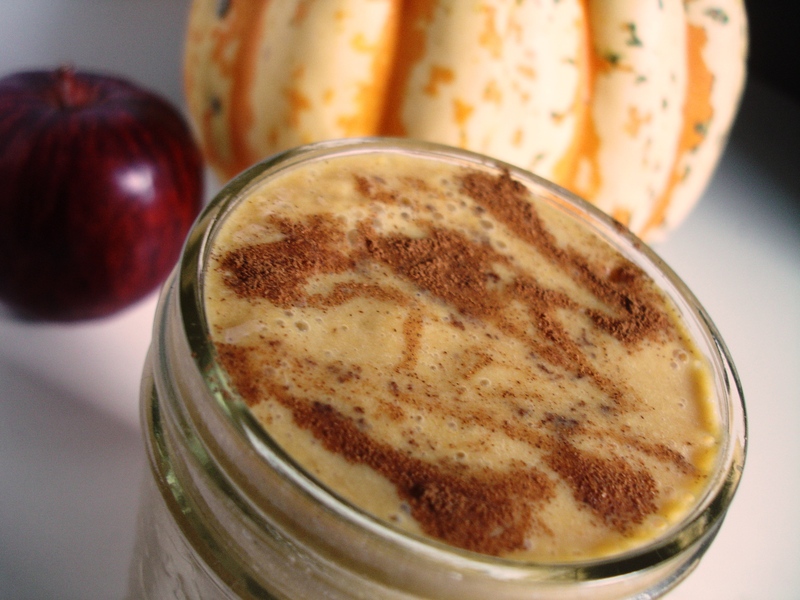 A standard pumpkin smoothie uses pumpkin pie spices (cinnamon, ginger, clove, nutmeg), but this one features turmeric, a superspice with anti-inflammatory properties among others. Personally, I just like it because it tastes good. Add all ingredients to a blender and blend until smooth. Pour into a glass and enjoy! So you’re all ready for thanksgiving dinner. Turkey? Check. Mashed potatoes? Check. Pumpkin pie? Check. BUT OH NO! You just remembered one of your guests is gluten-free! (In this case, my mom, who’s celiac – the real deal) But you can’t let them go without dessert! Enter the easiest, fastest most delicious, reasonably healthy fall dessert ever. Made in the microwave so it’s ready within minutes. Perfect for students with those annoying kitchenettes that don’t have ovens. Or people who are impatient. Carve a narrow hole out of the middle of the apple – essentially coring it, just enough to remove the seeds. Mix last three ingredients together in a bowl, then pack the mixture into the middle of the apple. Place the stuffed apple in the middle of a square of parchment paper, gather the paper up around the apple and twist. 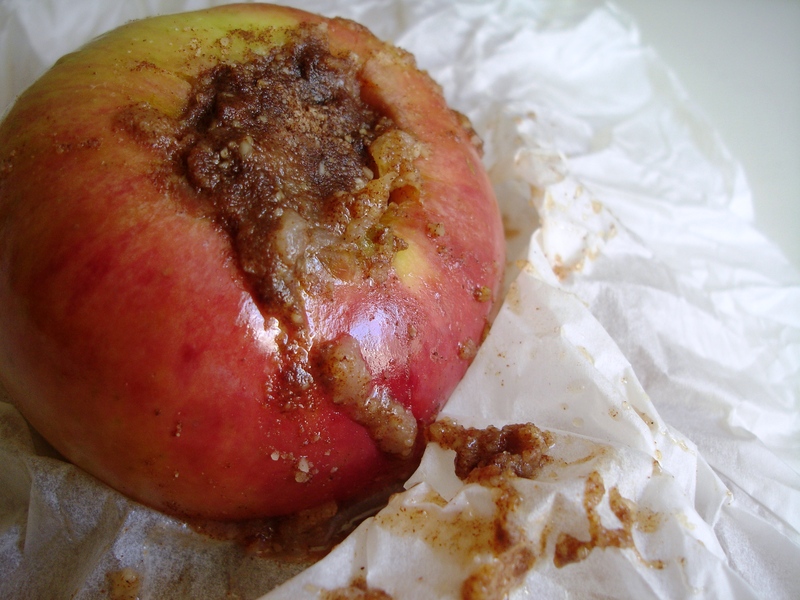 Place the packaged apple on a microwave-safe plate and microwave for 2 minutes. Unwrap when ready to eat. *Most of my recipes just serve one because I only cook for myself. If you want to make more of these, just increase the ingredients and microwave the apples separately or multiply the microwave time by the number of apples you’re cooking.